Nora Newton (nee Clementi) learned to cook at her mother’s knee in the years of World War II and later developed her skills through more than 60 years of happy marriage to Tony, enthusiastically experimenting with French, Italian and Asian dishes as well as those from the British Isles while preparing a near-constant supply of superb meals for her four children, nine grandchildren and the family at large. An early follower of Elizabeth David, Jane Grigson and Marguerite Patten and later a devotee of Gary Rhodes and Nigel Slater, she developed many recipes of her own, though she was always far too modest to claim expertise. 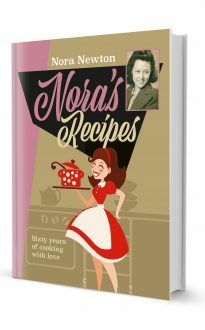 This book was compiled by her son Chris and published on what would have been Nora’s 88th birthday.